Our summer camp program is the heart of our work; we believe a good camping program provides a ripe opportunity for life-changing experiences. Each summer we serve approximately 200 campers, ages 9-14, in a traditional overnight summer camp setting. Our four summer sessions are divided by age and gender. Campers attend Alkulana for either an 8 day session (9-11 year old campers) or a 12 day session (12-14 year old campers). Our aim is to provide a camp experience for campers who would not otherwise be able to afford it. Therefore, the majority of our camper spots go to children and youth who are eligible for the USDA free or reduced lunch programs in their schools. Our campers are from the greater Richmond area, including Richmond city, Henrico, Hanover, Chesterfield, and Petersburg. Campers pay from $25-$100 for their camp experience. We provide transportation from Richmond to the campsite, which is about two and a half hours from the city. 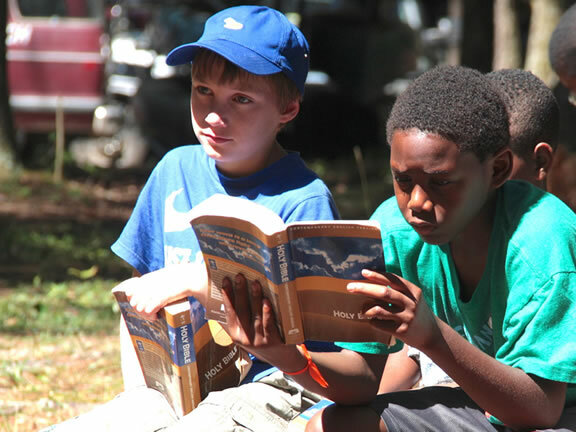 Campers will begin to or continue to recognize God’s love for them, and establish an ongoing relationship with God. Campers will understand and appreciate the intrinsic value in themselves and others. Campers will improve social skills. Campers will develop positive relationships with camp staff and other campers. Campers will be kept physically and emotionally safe. Campers will have the opportunity for physical and mental challenges and self-expression. Campers will develop an appreciation of the natural world.